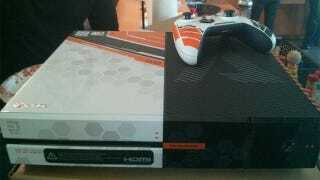 So That Titanfall Xbox One WAS Real. Sort Of. 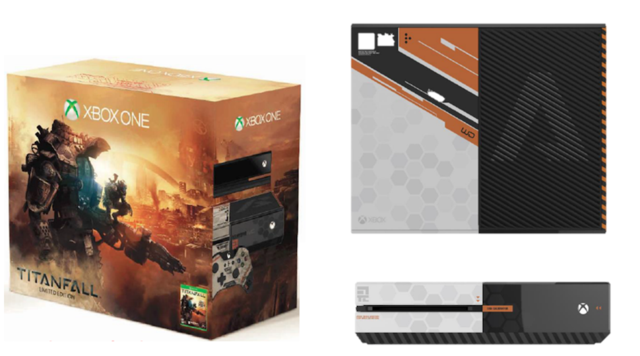 Back in January, there were rumours that Microsoft would be releasing a special Titanfall-branded Xbox One console. That machine never actually appeared. At least, it never did for consumers. Plans for a disc-free Xbox One? Halo 5 in 2015? A Halo 2 remake this fall? At least one of the consoles was made though, as it was presented to Respawn today by Microsoft. You can see in the image above that it matches the design from the January report. You'll also notice that, because the sticker under the disc drive is still there, this appears to be a production paintjob, not something extra they applied to a normal retail console. Jealous. A lot of people hated on the design, but to me, it looked like a Mass Effect-themed console, something Cerberus would have had lying around. Note that while the console itself is a special gift, the control pad is something you can buy.